On May 27th, Philip Petrie and John Michno of the SanDiego350 Interfaith Team presented a free climate change workshop, entitled “Faith and the Climate Crisis,” at the Seaside Center for Spiritual Living in Encinitas. Phil and John organized the workshop with Sandy Atkinson of Seaside Center’s Earth Care Ministry, along with other representatives of the Interfaith Coalition for Earth Justice (ICEJ). The San Dieguito Ministerial Association sponsored the event along with the Seaside Center. 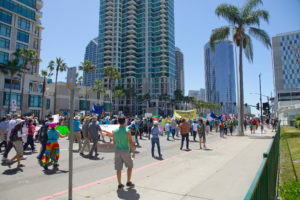 People marching in San Diego. Photo by Greg Lowe. 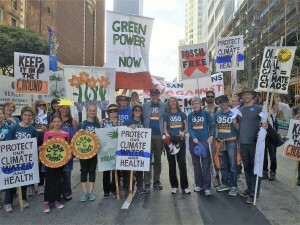 On April 29th, 2017, SanDiego350 and partner organizations put on our local version of the People’s Climate March. This march was held last in 2014 and around 1,500 people participated. This year, the goal was to double that number, but that’s not what happened. Instead, the rally and march drew over 5,000 people. A success by any measure, and that was matched by the tens of thousands across the country and across the world who took part in the collective march. There is no doubt our demands on our leaders to respect science in general and climate science in particular, to get in step with nearly all the rest of the world, was heard. Perhaps our voices were even loud enough to break through the walls that separate some people’s alternate worlds from ours. This is critical, because while our collective knowledge makes us powerful, our individual ignorance makes us dangerous. And one day’s march, no matter how many people take part, will not solve the problem. Only sustained presence, sustained demands, will impel our leaders to act on our demands and on the needs of our planet and the life it sustains. When I talk about the danger climate change represents, some of my acquaintances say I’m reverting to adolescence (I protested the ‘dresses only’ policy at my high school, back in my younger days). Others say I’m just reverting to type. On the evening of March 1, the organization Stay Cool 4 Grandkids hosted speakers who presented on two climate change topics. Representatives from Kids 4 Planet Earth spoke about their goal to have school children send one million letters to President Trump by Earth Day, telling him how important it is to them that he address climate change. Please help their request to go viral by sharing this goal on Facebook and other social media outlets. Two weeks ago, a sign-wielding crowd of 150 people gathered together in front of the downtown Federal Building to deliver an urgent message to California’s two Senators: reject four nominations made by President Trump to key cabinet-level level posts. Why? Because all four of these men deny the scientific consensus on human-caused climate change. Protesters rally against Trump’s Cabinet Nominees. Photo by Chris West. The International Women’s March was held on Saturday, January 21st, 2017. More than 670 sister marches were held around the world, in countries and places as diverse as Belarus, Ghana, Iraq, Vietnam, and Antarctica. All in all, an estimated 4.8 million people took part, all marching to declare that women’s rights are human rights, to demand justice for all, including the environment. SD350 members take part in Women’s March. Photo by Bill Wellhouse. It all started on one computer, with Theresa Shook asking 40 Facebook friends what if they descended upon Washington DC around Inauguration day to make their demands known? The next morning, she awoke to find that 10,000 people had signed up. The event(s) only escalated from there, in true democratic fashion. One person, indeed, can make a difference. One of humorist Will Rogers’ signature lines was: “Well, all I know is what I read in the papers.” In subtext, he’s saying he trusted what he read, so it seems reasonable to believe that in those days newspapers lived and died by getting the story right. What a simpler time; if Will was reading papers and the Internet and watching TV today, depending on the sources he chose, some to much of what he learned would be either misleading or just plain false. The information portal guardians have been overrun by hordes bearing rocket-propelled innuendo, guided missile conspiracy theories, and bandoleers bristling with self-serving lies. But that was only the first wall to fall. In this country, those hordes are no longer raging outside governmental gates; soon they will be the government itself. Welcome to the newest incarnation of the world. The rules, as they always do, have once again changed, and the eternal response is demanded: what do we do about it? How do we live now? Let’s start with a review of the situation. Truth, in both the social setting and as science’s burnished product, took a hard beating in this election cycle. But perhaps that was an almost foregone conclusion, obvious once recent history is examined from a certain angle. Social media seems to be everywhere these days with over a billion people on Facebook, Twitter, Instagram, Pinterest, Snapchat and other social media platforms. In fact, it’s hard to overstate the power of social media in our society. Change how people view climate change by posting images, facts, statistics and hyperlinks to relevant articles and by featuring in your posts people who are taking positive steps to address it. Create engagement with friends/followers and shares/likes – people want to be engaged and feel connected. That’s why social media is so popular. Build a support network around this issue – create a web of people to spread the word to their friends and followers and follow this issue that they care about, thus building bigger networks of change-makers. Extend the reach of your posts to people beyond your usual circle by including relevant hashtags and tags. Possibility of post going viral – viral posts have upwards of thousands or even millions of views, shares, and likes. With that kind of visibility and exposure, more people will start to contemplate your climate change message who might not otherwise even be aware of climate change. Over a two week period earlier this month, a wave of Break Free from Fossil Fuels mass mobilizations was held around the globe. The first action saw hundreds of people peacefully shut down the UK’s largest open cast coal mine in Wales. In the Philippines, 10,000 marched demanding the cancellation of a proposed 600-Megawatt coal power plant. In Australia, 2,000 people shut down the world’s largest coal port for a day, with kayakers blocking the harbor entrance while others blocked a critical rail crossing. In Anacortes, Washington, over the course of three days, thousands converged by land and water at the site of two oil refineries. They marched, led by indigenous leaders, and held an overnight sit-in on the train tracks that led to over 50 arrests. 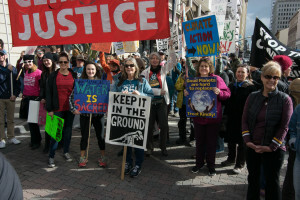 These were but a few of the many Break Free actions in the campaign which was organized by 350.org with support and participation from a wide range of international, national and local organizations including the Center for Biological Diversity, National Nurses United and the United Church of Christ. 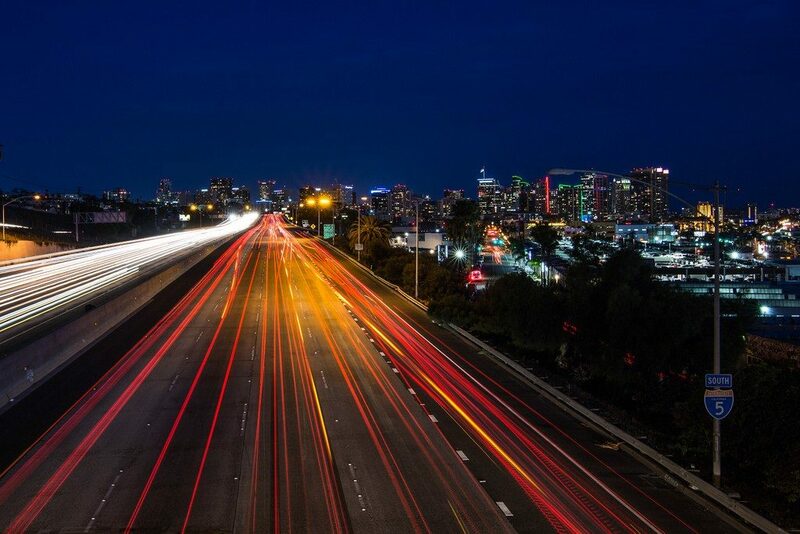 Closer to home, Los Angeles was the venue for a Break Free from Fossil Fuels action for people from all over California. Los Angeles is the biggest urban center for oil production in the nation and the Porter Ranch neighborhood was recently the site of the largest methane leak in U.S. history from SoCalGas’ Aliso Canyon gas storage facility.